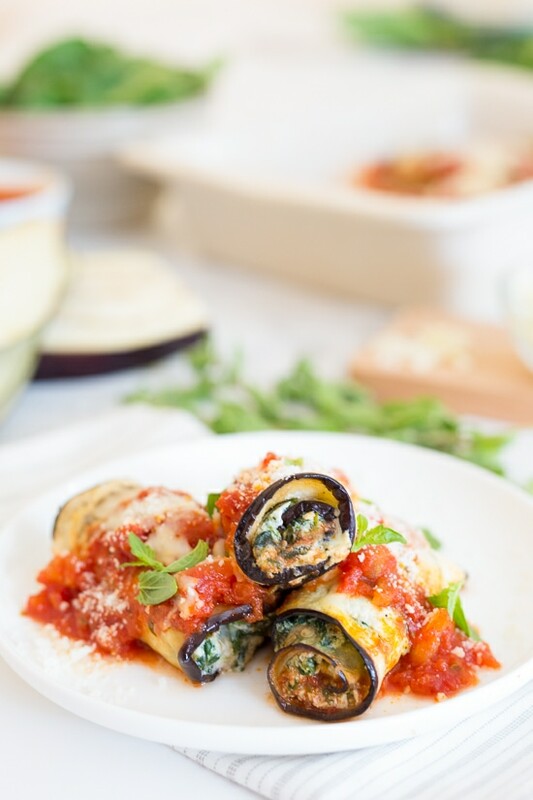 The best Eggplant Rollatini, made with thin slices of eggplant filled with a spinach and cheese ricotta filling, topped with marinara and mozzarella cheese. No frying, no breadcrumbs! 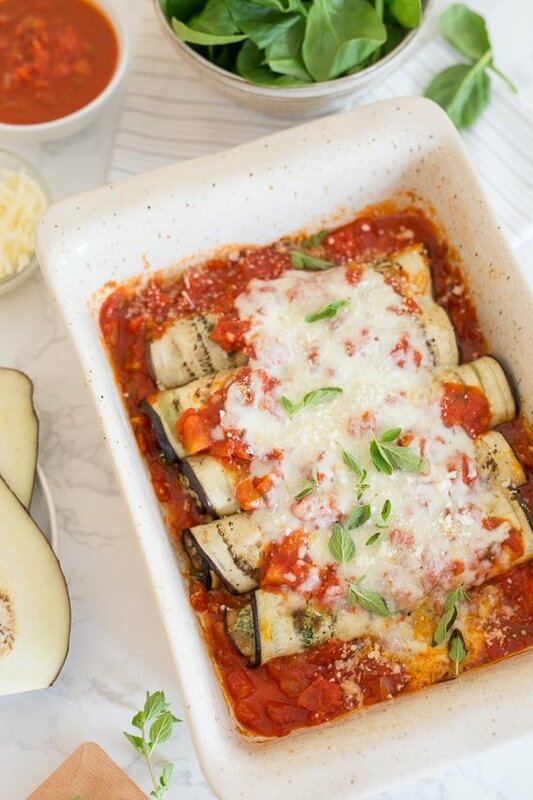 This is my favorite way to enjoy eggplant all summer long! It’s decadent, low-carb and plant based comfort food at it’s best yet made light with no breading and no frying. So good and better than most eggplant dishes I order at restaurants which are typically fried and loaded with calories. 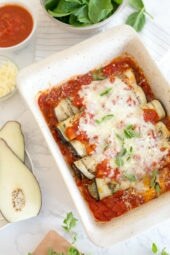 If you’re thinking your not a fan of eggplant, I know this recipe will change your mind. The eggplant is sliced so thin (I used my mandolin for perfect even slices) that it literally melts in your mouth once baked. Servings are super generous and filling. To slice the eggplant thin I recommend using a mandolin rather than using a knife to give me consistent even strips. I use OXO (click to see) (affil link). I also prefer to use two medium eggplants so my slices all come out even in size (can you say OCD?) and I save the odd-sized pieces for another recipe (chop it up and simmer it in marinara for a delicious Eggplant and Tomato Sauce). But if you prefer to use one large one and don’t mind all your rolls coming out different sizes, go for it. This recipe is a little more time consuming, so it’s great for weekends to prep ahead. You can keep this refrigerated overnight until it is ready to bake. You can freeze this prepped and ready before baking or bake it and freeze the leftover. To reheat, pop it in the oven covered with foil and bake 350F until heated through. PS- for those who want to know what brand of Mandolin, it’s available on Amazon, it’s from OXO (click to see). 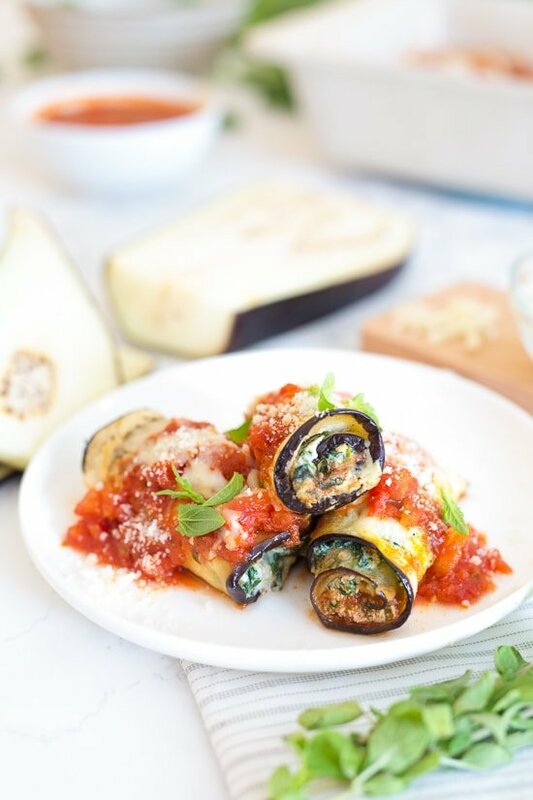 This is my favorite way to enjoy eggplant all summer long, hence calling it the Best Skinny Eggplant Rollatini with Spinach. It’s decadent, vegetarian comfort food at it’s best yet made light with no breading and no frying. So good and better than most eggplant dishes I order at restaurants which are typically fried and loaded with calories. Sprinkle the eggplant with kosher salt to help remove excess moisture and bitterness from the eggplants. Set aside for about 10 to 15 minutes. Pat dry with a towel. Preheat oven to 400°F. Season the eggplant with a little more salt and pepper, then arrange on two parchment-lined baking sheets. Cover tightly with foil and bake until eggplant is tender and pliable but NOT fully cooked, about 8 to 10 minutes. Spread 1/4 cup marinara sauce on the bottom of a 13 x 9-inch baking dish. In a medium bowl, beat the egg then mix together with ricotta, Pecorino Romano, spinach, garlic, 1/4 tsp salt and 1/8 tsp pepper. Pat eggplant dry with paper towels. Dividing the ricotta-spinach mixture (about 2 generous tablespoons each) evenly and spoon onto one end of each eggplant slice, spreading to cover. Starting at the short end, roll up slices and arrange them each seam side down in the prepared dish. Top with remaining marinara sauce and mozzarella cheese and tightly cover with foil. Bake until the eggplant is very tender, about 60 minutes. Remove from oven and let cool 5 minutes before serving with additional Pecorino Romano if desired. My husband is very finicky… Meat and potatoes kind of guy. If he has any idea this has Eggplant in it, he will refuse to even try it. Has anyone tried making it more lasagna style by layering? Will it make a difference? Anything I suspect he will refuse, I try to not tell him what’s in it if I can get away with it and it’s amazing how much he ends up liking it…. As long as he doesn’t know. Lol! This was so good! I *might* have used a bit more mozzarella on the top because we like a nice lightly toasted mozzarella crust on the top. I swear I will never be able to eat eggplant in a restaurant again! This was SO delicious!!!! I will definitely be making it again soon. these were so good & easy to make. I would definitely get a mandolin so I can make them more often. I followed the recipe exactly, except I was short on time. I layered it like lasagna! I used a little extra sauce to make it work, but it was so very tasty. Thank you for yet another great recipe! This is the BEST recipe! I now make this every single time I have dinner guests and it’s always a favourite. It’s so much lighter than a pasta but equally as good. Thank you! This is definitely a keeper! It was delicious! I added mushrooms with the spinach mix. I think the mandolin would be smart since it was har to get consistent slices. This is my go-to recipe and I love it. Thank you. I would like to make this for a group of 8 people, but I’m not sure everyone will love it the way that I do. Does anyone have a suggestion of what to make to compliment it for those that are meat eaters or do not like eggplant? 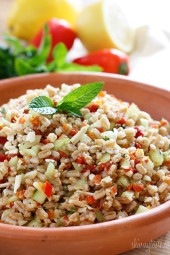 Sure, I think a casserole like http://skinnytaste.wpengine.com/sicilian-rice-ball-casserole/ would be great to add. Made this tonight and I thought it was great. Although my husband didn’t enjoy so much. But after I discussed with him about it being healthier then the traditional eggplant rollitini … fried and with all cheese …. he understood and said it wasn’t so bad. Pingback: Eggplant Rollatini with Spinach ! I made this tonight and loved it. Baked it for about 25 minutes. Sharing the leftover s with my coworker tomorrow. This is an awesome recipe! Rather than use frozen spinach, I sauteed fresh in olive oil and garlic, but everything else I did the same. Re-heats very nicely in the microwave, so it’s perfect for lunch. That’s awesome! Fresh from the garden is the best! I love eggplant dishes. I’ve been looking for a healthier version of moussaka, as it’s my favorite. Any chance you have one?! REALLY good–I used the quick marinara sauce from this site and it was great too. I subbed fat free cottage cheese for the ricotta, to save on calories and also I just like it better. I did have to double the amount of cottage cheese and still felt like I had to ration the filling to get all the eggplant strips filled. I did have a bit more than 10 slices, though, so maybe that is why. However, this recipe is a keeper! I served this alongside the Corn, tomato, and zucchini pasta also on this website, and together I got a really nice dinner for 7. YOU ARE MY HERO!! I made this last night (sliced eggplant to thin but still workable) AND GURRRLLL WINNER WINNER EGGPLANT DINNER…….I had some of the spinach mix left over so i spread on the top of these lil gems then covered with the gravy……i even sliced up extra, froze them for later go to meals!!! Delicious. A bit hit here! Excellent! My husband enjoyed and even had seconds. I made the whole recipe and we have leftovers for another scrumptious meal. I just bought a heavy duty OXO mandoline slicer and can’t wait to use it for this. I love eggplant but always get frustrated feeling like I waste so much of it. I never thought about using a mandoline. Thanks for that suggestion to make prep time faster! DELICIOUS!!!! My picky husband loved them and even raved about them to his mom!!! Thank you for the awesome recipes ! Have this in the oven now. I followed the directions exactly and found the slices of eggplant that had more seeds (in the center of each piece) didn’t stay together (the middle broke apart) after the first cooking in the oven. I had enough to piece them together with another slice. They might not be as pretty as these pictures, but I’m sure it will all taste fabulous when they are cooked, just an FYI for everyone. Love your recipes! Excellent. I rinsed my eggplant after the sweat from salting and prior to putting in the oven. I added 1 sliced mushroom to each slice of eggplant prior to rolling. Also, I found some Chinese eggplant at a Farmer’s Market which really are only slimmer and longer than regular eggplant ( they were the shape of medium zucchini). I will definitely add this to my recipe list. Better than eggplant parmesan and healthier too. Can you peel the eggplant? First let me say I love receiving your emails and recipes! I tried this recipe with some ingredient modifications. I didn’t have spinach or ricotta but had some frozen collard greens and cottage cheese. Loved how it turned out. I can’t wait to try the eggplant meatballs. Thank you for sharing! I can enjoy eggplant again! I always felt guilty because of the frying,, I made this recipe yesterday and we absolutely loved it. I put the. Arinara sauce together in the morning, prepped the filling and baked the eggplant and set it all aside till after work. Assembled the rolatinis and left it to bake for an hour and it looked just like yours in the video! This will be great for company as a make ahead, thanks Gina! I followed you recipe exactly it was delicious! Thank you! Made yesterday but have not ate yet–a lot of work and does not make enough filling for 2 tbs for each piece of eggplant-only used a scant tbs for each and had to add more ricotta cheese to stretch to fill rest of eggplant slices???? Cooked this tonight and yes was delicious thanks so much Gina, love your recipes from us here in Queensland Australia . Hi Gina — I am researching recipes to freeze for after our baby is born. Any suggestions for freezing this favorite of ours? It will be my first time doing so! I think this would freeze well before baking. Thank you for your reply! Do you think we should bake at the same temperature/time after freezing? I’m converted! Never knew eggplant could taste so good without being breaded and fried!! Thank you for this recipe! It turned out delicious. I cut it in half and made some changes based on my nutrition needs/kitchen stock. I used low fat cottage cheese, feta, egg white and added chopped chicken along with a little onion. It was the perfect way to use my garden’s first eggplant! Great texture. For anyone wanting to half the recipe, the amount fits perfectly into a rectangle bread loaf pan. Just wanted a clarification: The serving size says 2 rollups, but the picture has 3. Are the points given for 2 rollups or for 3? Thanks! Gina–Thank you for this recipe. It looks amazing and I’ll surely try it. FYI: I ordered the Oxo mandoline from Amazon, and it was awful. As always, Amazon took it back. I re-ordered instead the mandoline by HomeNative. It’s perfect. It does a great job, came with five interchangeable blades, a food catcher/storage container with lid and a very necessary safety glove. I couldn’t be happier. Did I mention it was $20 cheaper than the Oxo? I made this and in the oven right now. Had no problems except ran out if filling mixture . I was meticulous about measuring the ingredients. 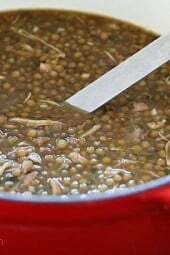 Use two level tablespoons and was short of mixture. Should the recipe have read two teaspoons instead of tablesponns. Can this meal be frozen for leftovers? Made tonight and both my husband and I loved!!! Perfect when I can make something healthy – not tell my husband it’s “diet” and he loves it… secret with your recipes is never telling the hubby they are healthy!! If I prep this today, should I stick it in the fridge or freezer? If I bake it on a Thursday, is that too far away? Thanks! I’m house sitting this weekend, so I’m trying to plan my meals! Hello. Can I make this ahead up to step 6 and refrigerate then bake it off the next day? Was hoping to take this for Easter dinner. Thanks in advance! Sorry for the late response but yes you can! Can someone please clarify if the Italian Eggplants are the regular bit eggplants or the smaller ones? I’m getting mixed information at every store I check. Can you cook and freeze this recipe for lateR? I tried this tonight and it was a hit! I simplified it quite a bit. I used canned tomato sauce (homemade marinara was a little ambitious for me), left out the egg and other seasonings, especially the salt (I used garlic powder). I read the comments about the eggplant falling apart. So, I baked each slice at 400 for 3 mins per side. Just enough to start cooking, and turn tender, but not mushy or crumbly. But, the recommended 2 tablespoons of stuffing didnt add up. I used one tbsp per roll, and found that when i got to halfway through, there wouldnt be enough (queue the unroll and start over!). I don’t have a mandoline, so I cut by knife. I hacked the first one, so I chopped it up and used it in the stuffing, which made it go farther. I ended up with 15 (again, cut by hand, so no magic equal number). I baked at 400 for 55 mins, removed from oven, topped with mozzarella, and put the foil back over top for another 5 (didn’t put back in oven). Ate 4 rolls at 56 cals/each, totaling an astonishing 224 cals!!! Definitely an amazing amount of food for such a teeny calorie count. Adding this one to the recipe book! What is the temperature to cook the dish once it together ? This is my absolute favorite recipe! I use a frozen kale, spinach, and chard blend from whole foods ans sub fat free cottage cheese for the ricotta since I typically have that on hand. Perfection! Thanks so much for introducing me to such deliciousness! This was absolutely amazing and better than any eggplant dish I’ve ever had. I made it for my husband’s parents who have never eaten eggplant before and they both loved it. We traveled to their home for diner so I prepped it all the way up to the final baking at home, then popped it into their oven when we got there. It turned out great. Served it with speghetti. I am just wondering. The recipe is posted as freezer friendly, but I do not see directions how to freeze it? I’m thinking make up to step 7, then freeze, then step 7 after thawed? Made this tonight. Great dish! Family enjoyed it. I have one who will NOT eat eggplant at all!! Any suggestions? Do you think the eggplant would hold up ok if this dish was covered and refrigerated just prior to the final baking and saved for later…or even the next day? It’s in the oven right now but I took a look at it and it seems to have lots of water in it. Not sure if I should remove the foil? Made this for the first time last week, and I’m making it again tonight! My family LOVES this!! I’ll probably leave the salt out of the spinach mixture because it was a bit on the salty side, but it was still fantastic! I just made this and it is absolutely amazing. My husband, who is my worse critic, ate it all up. Just to be fair, I am his worse critic too…:) Instead of the ricotta cheese, I used plain Greek yogurt and it was fantastic. Thank you for this recipe! I am going to be trying some other ones soon. Thanks again! I made this as written and it is absolutely fabulous! Except I cheated and used Francesco Rinaldi Marinara Sauce which is yummy! Hi! Does this make good leftovers? I would like to make it for the week for lunches. Thanks! Fabulous for leftovers. Tastes as good as the first day if not better. Made this with kale tonight – awesome!! I made this recently and it is most definitely going to be a staple…Love Love Love it!! My husband and I are food people. We love eating, we love cooking, we love feeding people. I just finished eating this dish that I prepare today and it was SPECTACULAR. This was delicious. My eggplant was too wide for my mandoline so I had to cut them in half, lengthwise, and ended up with twice as many, but much narrower, slices. Since the slices were so thin, I skipped the pre-baking step and after salting/toweling off the eggplant slices, I microwaved them for 3 minutes, then continued with the recipe. My rollatini were much smaller, so I only baked the dish for 35 minutes. A+ recipe. I'll definitely make this again – soon! Loved this recipe!! How do you recommend reheating the leftovers? I made this today and my entire family loved it. This ia alsi my first time making anything out of eggplant. This recipe is definitely a keeper. This recipe was a complete flop !! I followed the directions to a tee. After taking the egg plant out of the oven at 8 minutes it completely fell apart & went into the trash. Vac sealed the cheese & spinach mixture to freeze it for a later recipe. Maybe my oven setting is off ? I've never had a problem with it before though. I had the SAME EXACT PROBLEM! We followed the directions 100% so I have no idea why, but I'm pretty bummed, given the work put into it. I managed to assemble about 1/2 of them but man, what a waste. On a side note, I made these two weeks ago with zucchini and they came out amazing!!! It just made a lot more and we had about 4 per serving. ooo! so glad to hear! I really do not like eggplant and wondered if zuchinni would work. thanks! Do you think if we premade these – 2 batches one for the evening dinner … that we could freeze the other and still retain the flavors and textures of the original dish? Do you think freeze before baking? Or After baked and cooled? did you ever try this. I was wondering if I could freeze too!! I've made this recipe a couple of times and loved it each time. Tonight I went vegan with it, skipped the egg, used cashew ricotta cheese and go veggie mozzarella. It was deliriously amazing! Thanks Gina for your creative spirit and kitchen know how! Cooked tonight. This was delicious! 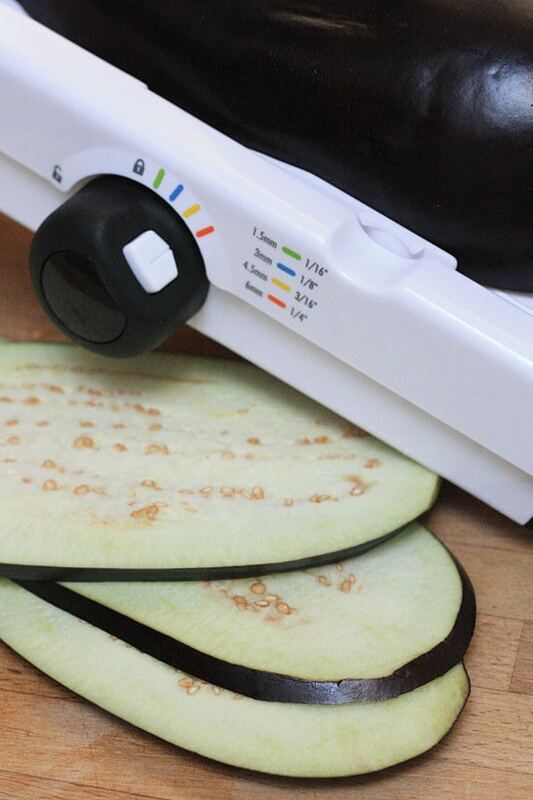 Nice alternative to frying eggplant. I made these last week and they were SO good!! Thank you!! Hi making this today for my party, question, can i bake and than, reheat later tonight. This dish is delicious, but it has way too much salt. I ate the leftovers for a couple of days and each day it was saltier and saltier to the point it was inedible. I would suggest rinsing the eggplant after salting and not salting it again before it goes in the oven. Then omit the salt from the cheese mixture as the cheeses already have salt. Just made this and OMGsh, its better than Eggplant Parmesan! 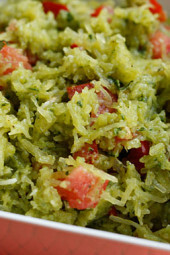 I have made this 3 or 4 times now with roasted spaghetti squash and it is AMAZING every time. Great recipe! This is vegetarian friendly, but not vegan friendly. Vegetarians eat cheese and dairy, vegans do not. Unless most cheeses, Pecorino is made with Rennet, which is not a vegetarian ingredient. Rennet is removed from the stomach of animals, in the case of Pecorino, the source is the lamb stomach. It is vegetarian friendly. It’s not VEGAN friendly. I just made this with no egg, fat free ricotta and mozzarella cheese AND added spinach (fresh), mushroom, and onions. Instead of marinara I used spaghetti sauce. IT CAME OUT AMAZING! Did you cook the fresh spinach before adding it to the ricotta mixture? Do you think that the marinated and grilled eggplant slices from Trader Joe's would work in this recipe?